Download "HEALTH PROFESSIONAL WORKFORCE (SECTION-BY-SECTION ANALYSIS)"
1 HEALTH PROFESSIONAL WORKFORCE (SECTION-BY-SECTION ANALYSIS) (Information compiled from the Democratic Policy Committee (DPC) Report on The Patient Protection and Affordable Care Act and the Health Care and Education Reconciliation Act. Available online at Quality Improvement and Patient Safety Sec Demonstration program to integrate quality improvement and patient safety training into clinical education of health professionals. Establishes a program at AHRQ to give grants to academic institutions to develop and implement academic curricula that integrate quality improvement and patient safety into health professionals clinical education. Patient Navigators Sec Patient navigator program. Reauthorizes demonstration programs to provide patient navigator services within communities to assist patients overcome barriers to health services. Program facilitates care by assisting individuals coordinate health services and provider referrals, assist community organizations in helping individuals receive better access to care, information on clinical trials, and conduct outreach to health disparity populations. State Workforce Development Grants Sec State health care workforce development grants. Competitive grants are created for the purpose of enabling State partnerships to complete comprehensive planning and to carry out activities leading to coherent and comprehensive health care workforce development strategies at the State and local levels. Grants will support innovative approaches to increase the number of skilled health care workers such as health care career pathways for young people and adults. State and Regional Workforce Development Centers Sec Health care workforce assessment. Codifies the existing national center and establishes several regional centers for health workforce analysis to collect, analyze, and report data related to Title VII (of the Public Health Service Act) primary care workforce programs. The centers will coordinate with State and local agencies collecting labor and workforce statistical information and coordinate and provide analyses and reports on Title VII to the Commission. Federally Supported Student Loans Sec Federally supported student loan funds. Eases current criteria for schools and students to qualify for loans, shorten payback periods, and decreases the non-compliance provision to make the primary care student loan program more attractive to medical students. Sec Amendments to Title V. (d) Loan repayment for faculty at schools that train physician assistants. Includes faculty at schools for physician assistants as eligible or faculty loan repayment within the workforce diversity program. Nursing Workforce Sec Nursing student loan program. Increases loan amounts and updates the years for nursing schools to establish and maintain student loan funds. Sec Advanced nursing education grants. Strengthens language for accredited Nurse Midwifery programs to receive advanced nurse education grants in Title VIII of the Public Health Service Act. Sec Nurse education, practice, and retention grants. Awards grants to nursing schools to strengthen nurse education and training programs and to improve nurse retention. 2 Nursing Workforce Continued Sec Loan repayment and scholarship program. Adds faculty at nursing schools as eligible individuals for loan repayment and scholarship programs. Sec Nurse faculty loan program. Establishes a Federally-funded student loan repayment program for nurses with outstanding debt who pursue careers in nurse education. Nurses agree to teach at an accredited school of nursing for at least 4 years within a 6-year period. Sec Authorization of appropriations for parts B through D of title VIII. Authorizes $338 million to fund Title VIII of the Public Health Service Act nursing programs. Sec Workforce diversity grants. Expands the allowable uses of nursing diversity grants to include completion of associate degrees, bridge or degree completion program, or advanced degrees in nursing, as well as pre-entry preparation, advanced education preparation, and retention activities. Pediatric Special Loan Repayment Sec Health care workforce loan repayment programs. Establishes a loan repayment program for pediatric subspecialists and providers of mental and behavioral health services to children and adolescents who are or will be working in a Health Professional Shortage Area, Medically Underserved Area, or with a Medically Underserved Population. Public Health Workforce Loan Repayment Program Sec Public health workforce recruitment and retention program. Offers loan repayment to public health students and workers in exchange for working at least 3 years at a federal, state, local, or tribal public health agency. Allied Health Loan Repayment Sec Allied health workforce recruitment and retention program. Offers loan repayment to allied health professionals employed at public health agencies or in settings providing health care to patients, including acute care facilities, ambulatory care facilities, residences, and other settings located in Health Professional Shortage Areas, Medically Underserved Areas, or serving Medically Underserved Populations. Mid-Career Public and Allied Health Professionals Sec Grants for States and local programs. Awards scholarships to mid-career public and allied health professionals employed in public and allied health positions at the Federal, State, tribal, or local level to receive additional training in public or allied health fields. National Health Service Corp Sec Funding for National Health Service Corps. Increases and extends the authorization of appropriations for the National Health Service Corps scholarship and loan repayment program for FY Primary Care Grants to Schools Sec Training in family medicine, general internal medicine, general pediatrics, and physician assistantship. Provides grants to develop and operate training programs, provide financial assistance to trainees and faculty, enhance faculty development in primary care and physician assistant programs, and to establish, maintain, and improve academic units in primary care. Priority is given to programs that educate students in team-based approaches to care, including the patientcentered medical home. 3 Direct Care Workforce Sec Training opportunities for direct care workers. Authorizes funding over three years to establish new training opportunities for direct care workers providing long-term care services and supports. Dentistry Sec Training in general, pediatric, and public health dentistry. 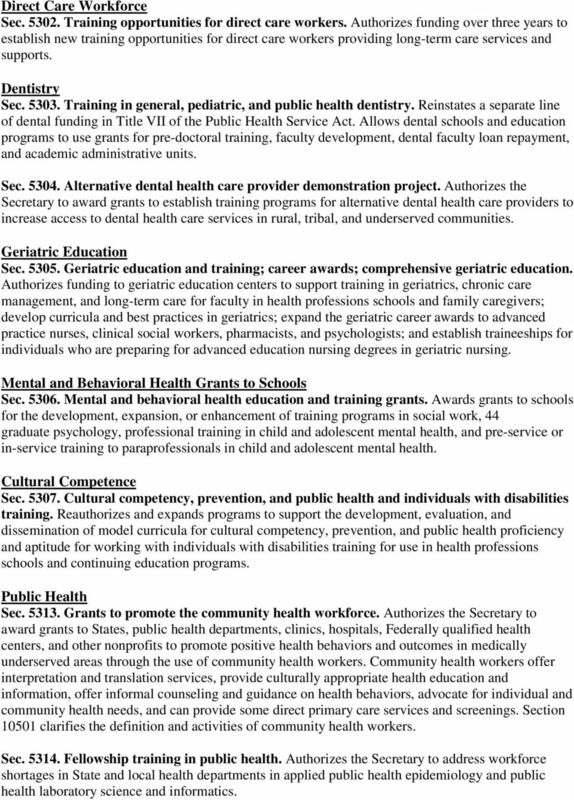 Reinstates a separate line of dental funding in Title VII of the Public Health Service Act. Allows dental schools and education programs to use grants for pre-doctoral training, faculty development, dental faculty loan repayment, and academic administrative units. Sec Alternative dental health care provider demonstration project. Authorizes the Secretary to award grants to establish training programs for alternative dental health care providers to increase access to dental health care services in rural, tribal, and underserved communities. Geriatric Education Sec Geriatric education and training; career awards; comprehensive geriatric education. Authorizes funding to geriatric education centers to support training in geriatrics, chronic care management, and long-term care for faculty in health professions schools and family caregivers; develop curricula and best practices in geriatrics; expand the geriatric career awards to advanced practice nurses, clinical social workers, pharmacists, and psychologists; and establish traineeships for individuals who are preparing for advanced education nursing degrees in geriatric nursing. Mental and Behavioral Health Grants to Schools Sec Mental and behavioral health education and training grants. Awards grants to schools for the development, expansion, or enhancement of training programs in social work, 44 graduate psychology, professional training in child and adolescent mental health, and pre-service or in-service training to paraprofessionals in child and adolescent mental health. Cultural Competence Sec Cultural competency, prevention, and public health and individuals with disabilities training. 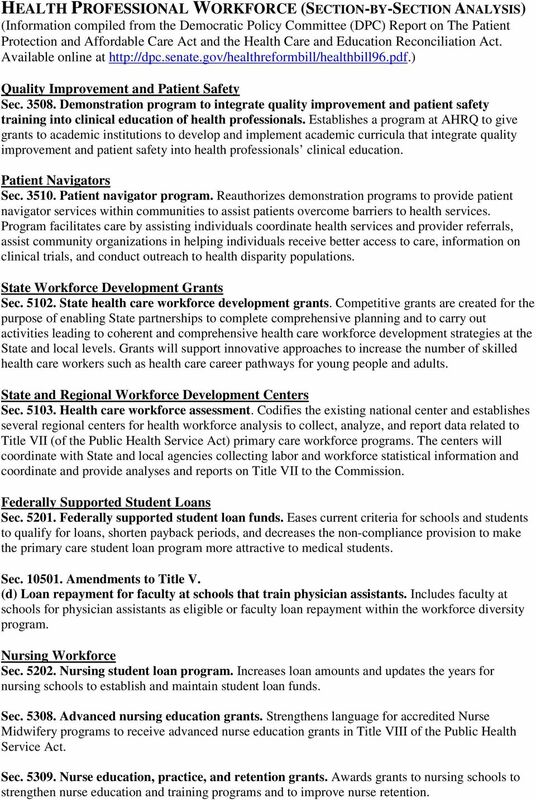 Reauthorizes and expands programs to support the development, evaluation, and dissemination of model curricula for cultural competency, prevention, and public health proficiency and aptitude for working with individuals with disabilities training for use in health professions schools and continuing education programs. Public Health Sec Grants to promote the community health workforce. Authorizes the Secretary to award grants to States, public health departments, clinics, hospitals, Federally qualified health centers, and other nonprofits to promote positive health behaviors and outcomes in medically underserved areas through the use of community health workers. Community health workers offer interpretation and translation services, provide culturally appropriate health education and information, offer informal counseling and guidance on health behaviors, advocate for individual and community health needs, and can provide some direct primary care services and screenings. Section clarifies the definition and activities of community health workers. Sec Fellowship training in public health. Authorizes the Secretary to address workforce shortages in State and local health departments in applied public health epidemiology and public health laboratory science and informatics. 4 Public Health Sciences Track Sec United States Public Health Sciences Track. Directs the Surgeon General to establish a U.S. Public Health Sciences Track to train physicians, dentists, nurses, physician assistants, mental and behavior health specialists, and public health professionals emphasizing team-based service, public health, epidemiology, and emergency preparedness and response in affiliated institutions. Students receive tuition remission and a stipend and are accepted as Commission Corps officers in the U.S. Public Health Service with a 2-year service commitment for each year of school covered. Family Nurse Practitioner Grants Sec Demonstration grants for family nurse practitioner training programs. As added by Section 10501, establishes a training demonstration program that supports recent Family Nurse Practitioner graduates in primary care for a twelve month period in Federally Qualified Health Centers (FQHCs) and nurse-managed health clinics. The demonstration is authorized from 2011 through Under-Represented Minorities Sec Centers of excellence. The Centers of Excellence program, which develops a minority applicant pool to enhance recruitment, training, academic performance and other supports for minorities interested in careers in health, is reauthorized at 150 percent of 2005 appropriations, $50 million. Sec Health professions training for diversity. Provides scholarships for disadvantaged students who commit to work in medically underserved areas as primary care providers, and expands loan repayments for individuals who will serve as faculty in eligible institutions. Funding is increased from $37 to $51 million for 2009 through Interdisciplinary, Community-Based Linkages Sec Interdisciplinary, community-based linkages. Authorizes funding to establish community-based training and education grants for Area Health Education Centers (AHECs) and Programs. Two programs are supported - Infrastructure Development Awards and Points of Service Enhancement and Maintenance Awards - targeting individuals seeking careers in the health professions from urban and rural medically underserved communities. 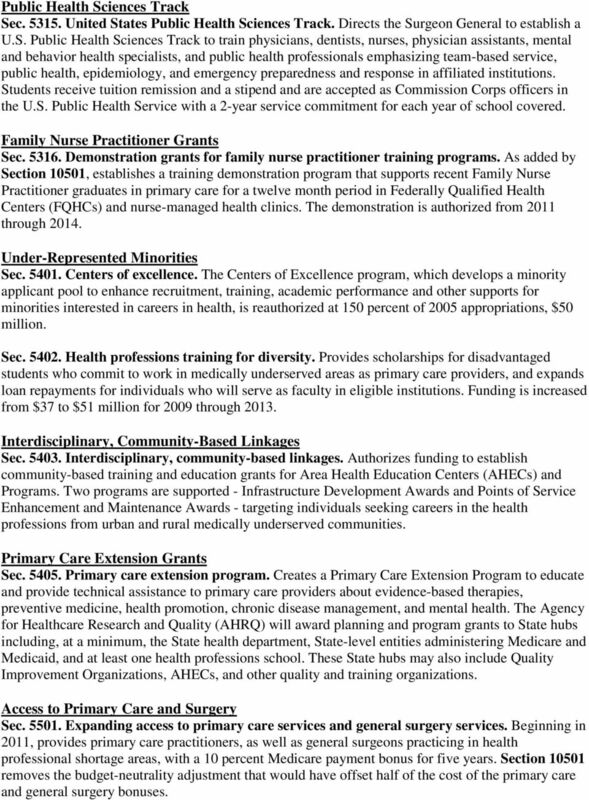 Primary Care Extension Grants Sec Primary care extension program. Creates a Primary Care Extension Program to educate and provide technical assistance to primary care providers about evidence-based therapies, preventive medicine, health promotion, chronic disease management, and mental health. The Agency for Healthcare Research and Quality (AHRQ) will award planning and program grants to State hubs including, at a minimum, the State health department, State-level entities administering Medicare and Medicaid, and at least one health professions school. These State hubs may also include Quality Improvement Organizations, AHECs, and other quality and training organizations. Access to Primary Care and Surgery Sec Expanding access to primary care services and general surgery services. Beginning in 2011, provides primary care practitioners, as well as general surgeons practicing in health professional shortage areas, with a 10 percent Medicare payment bonus for five years. Section removes the budget-neutrality adjustment that would have offset half of the cost of the primary care and general surgery bonuses. 5 Medicare FQHC Improvements Sec Medicare Federally qualified health center improvements. Directs the Secretary of Health and Human Services to develop and implement a prospective payment system (PPS) for Medicare-covered services furnished by Federally Qualified Health Centers (FQHCs). Additionally, adds remaining Medicare-covered preventive services to the list of services eligible for reimbursement when furnished by an FQHC. Section clarifies that the Secretary of HHS shall vary payments to FQHCs based on the type, duration, and intensity of services they deliver and establishes an annual FQHC market basket update. Graduate Medical Education Sec Distribution of additional residency positions. Beginning July 1, 2011, directs the Secretary to redistribute residency positions that have been unfilled for the prior three cost reports and directs those slots for training of primary care physicians. 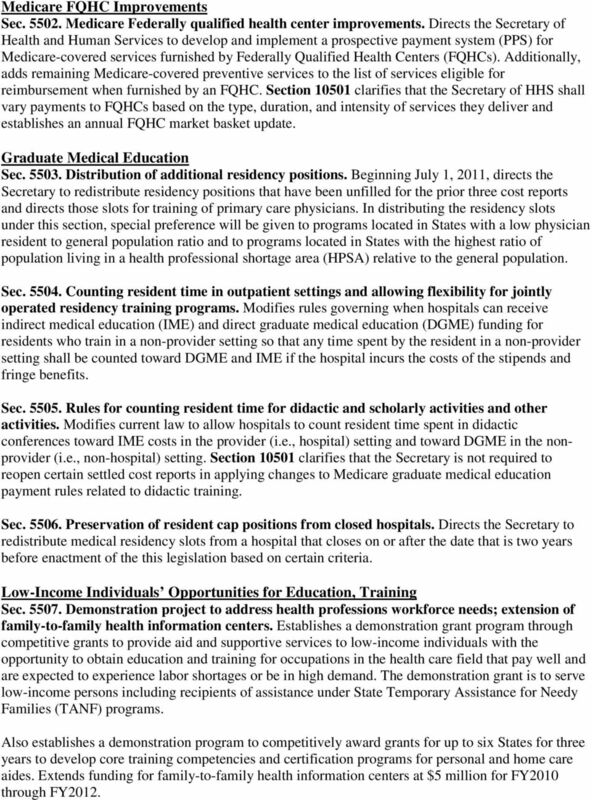 In distributing the residency slots under this section, special preference will be given to programs located in States with a low physician resident to general population ratio and to programs located in States with the highest ratio of population living in a health professional shortage area (HPSA) relative to the general population. Sec Counting resident time in outpatient settings and allowing flexibility for jointly operated residency training programs. Modifies rules governing when hospitals can receive indirect medical education (IME) and direct graduate medical education (DGME) funding for residents who train in a non-provider setting so that any time spent by the resident in a non-provider setting shall be counted toward DGME and IME if the hospital incurs the costs of the stipends and fringe benefits. Sec Rules for counting resident time for didactic and scholarly activities and other activities. Modifies current law to allow hospitals to count resident time spent in didactic conferences toward IME costs in the provider (i.e., hospital) setting and toward DGME in the nonprovider (i.e., non-hospital) setting. Section clarifies that the Secretary is not required to reopen certain settled cost reports in applying changes to Medicare graduate medical education payment rules related to didactic training. Sec Preservation of resident cap positions from closed hospitals. Directs the Secretary to redistribute medical residency slots from a hospital that closes on or after the date that is two years before enactment of the this legislation based on certain criteria. Low-Income Individuals Opportunities for Education, Training Sec Demonstration project to address health professions workforce needs; extension of family-to-family health information centers. Establishes a demonstration grant program through competitive grants to provide aid and supportive services to low-income individuals with the opportunity to obtain education and training for occupations in the health care field that pay well and are expected to experience labor shortages or be in high demand. The demonstration grant is to serve low-income persons including recipients of assistance under State Temporary Assistance for Needy Families (TANF) programs. Also establishes a demonstration program to competitively award grants for up to six States for three years to develop core training competencies and certification programs for personal and home care aides. Extends funding for family-to-family health information centers at $5 million for FY2010 through FY2012. 6 Primary Care Residencies in Teaching Health Centers (FQHCs) Sec Increasing teaching capacity. Directs the Secretary to establish a grant program to support new or expanded primary care residency programs at teaching health centers and authorizes $25 million for FY2010, $50 million for FY2011 and FY2012 and such sums as may be necessary for each fiscal year thereafter to carry out such program. Also provides $230 million in funding under the Public Health Service Act to cover the indirect and direct expenses of qualifying teaching health centers related to training primary care residents in certain expanded or new programs. Graduate Nurse Education Sec Graduate nurse education demonstration program. This provision directs the Secretary to establish a demonstration program to increase graduate nurse education training under Medicare and authorizes $50 million to be appropriated from the Medicare Hospital Insurance Trust Fund for each of the fiscal years 2012 through 2015 for such purpose. Rural Physician Training Grants Sec State grants to health care providers who provide services to a high percentage of medically underserved populations or other special populations. As added by Section 10501, creates a grant program to support health care providers who treat a high percentage of medically underserved populations. 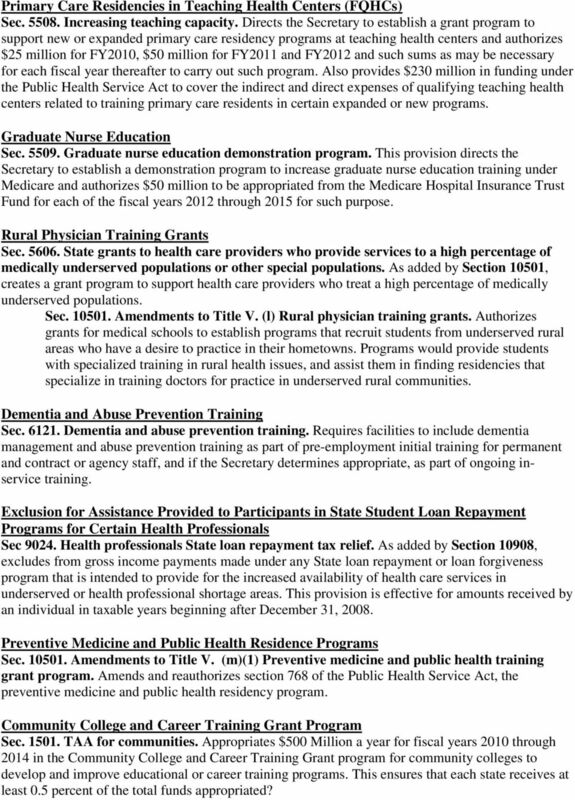 Sec Amendments to Title V. (l) Rural physician training grants. Authorizes grants for medical schools to establish programs that recruit students from underserved rural areas who have a desire to practice in their hometowns. Programs would provide students with specialized training in rural health issues, and assist them in finding residencies that specialize in training doctors for practice in underserved rural communities. Dementia and Abuse Prevention Training Sec Dementia and abuse prevention training. Requires facilities to include dementia management and abuse prevention training as part of pre-employment initial training for permanent and contract or agency staff, and if the Secretary determines appropriate, as part of ongoing inservice training. Exclusion for Assistance Provided to Participants in State Student Loan Repayment Programs for Certain Health Professionals Sec Health professionals State loan repayment tax relief. 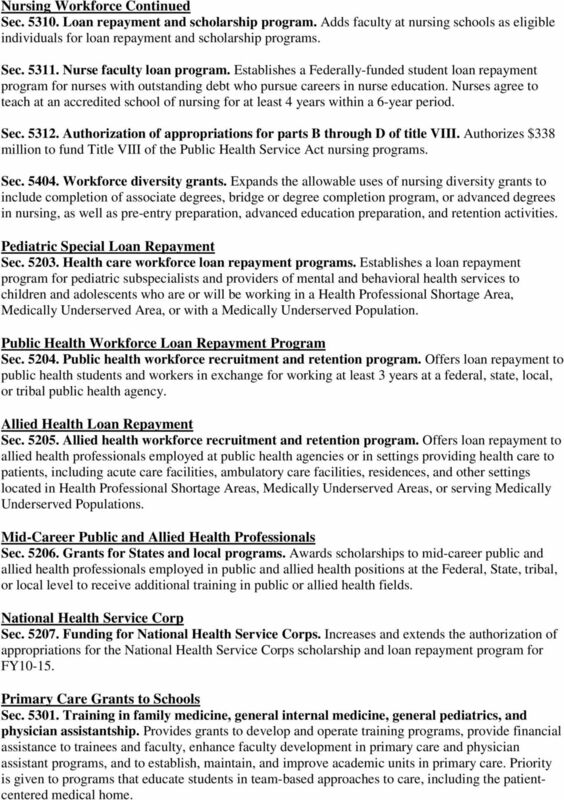 As added by Section 10908, excludes from gross income payments made under any State loan repayment or loan forgiveness program that is intended to provide for the increased availability of health care services in underserved or health professional shortage areas. This provision is effective for amounts received by an individual in taxable years beginning after December 31, Preventive Medicine and Public Health Residence Programs Sec Amendments to Title V. (m)(1) Preventive medicine and public health training grant program. Amends and reauthorizes section 768 of the Public Health Service Act, the preventive medicine and public health residency program. Community College and Career Training Grant Program Sec TAA for communities. Appropriates $500 Million a year for fiscal years 2010 through 2014 in the Community College and Career Training Grant program for community colleges to develop and improve educational or career training programs. This ensures that each state receives at least 0.5 percent of the total funds appropriated? Date: May 24 th, 2010 Time: 9:00 am 4:30pm Location: ODJFS Lazarus 621 A and B Organizer(s): Erika Robbins/Tiffany Dixon 4020 E.